Officially named Watsomanas Ratchawora Wiharn, this temple was built as an act of merit by King Rama 4, Phrabat somdej Phra chomklao. The king dedicated the new wat to Somdej Phra Nang Chao Somanat Watthanawadee, his consort, who died at the beginning of his reign. It is officially a royal temple in the category of Ratchawora Wiharn, second class. The grounds of Watsomanas Wiharn encompass slightly more than thirty-one rai, including the moats on three sides. The Phadung Krung Kasem canal runs in front of the temple. On Monday, the second day of the waning moon, in the second month of the year of the Ox, 2396 B.E., or January 15, 1853, Phrabat Somdej Phra Chomklao Chao Yoo Hua laid the foundation stone for the temple. The ubosot, wiharn, cloister and chedi were to be located in the middle zone, the precinct of the Buddha image. Clusered on two sides were the monks' dwelling places. Three groups of monks would live on each side. Before the temple a large courtyard was planned. All the temples along Phadung Krung Kasem canal, for example, Watsomanas Wiharn, Watmakutkasat Tiryaram, and Wat thepsirin tarawat, have this distinctive layout, especially the wide forecourt. This front court at Watsomanas Wiharn has been used as a school. Today, there is a crematorium at the back, and a cemetery on the side. covered with pea or bean vines. The area was quite uninhabited in those days, without the dense crowd of shops and residences that now surround the temple. install a relic of the Lord Buddha at the principal chedi. Seven years later in B.E. 2422, The year of the Rabbit, phra Phimolathamawas honored still further with the new title of Somdej Phrawannarat. principal Buddha image in the wiharn and the images of the disciples were royal properties which were brought from the Grand Palace. The temple thus became a complete Buddhist monastery, financially supported from the inheritance of the late Somdej Phra Nang Chao Somanat Watthanawadee. front area, next to the Phadung Krung Kasem canal. That area remains as open ground, and is relatively quiet, compared to the back of the temple where the crematorium is located. As the temple is now part of an area also occupied by government offices, it is well known and easy ti find. Big trees contribute to its pleasant, shady surroundings. Easy access, an agreeable environment, and warm cooperation from temple administrators has encouraged large nubers of Buddhists to come to Watsomanas for dhamma practice and meditation sessions. The sanctuary (Buddhavasa) and the monastic area of the monastery ( Sanghavasa) have been clearly delimited. 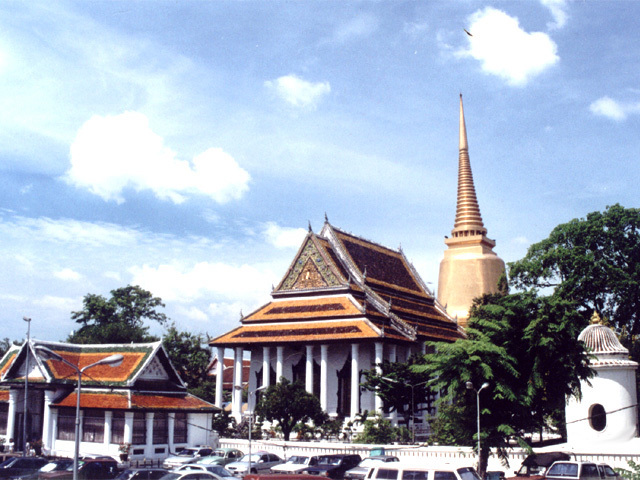 The former, which is in the middle, comprises the Phra Ubosatha (Church), the Phra Vihara ( Assembly Hall), the Cloister and the pagoda. The latter, located alongside the sanctuary is the dwelling compound of monks and novices. Buit at the behest of King Mongkut [Rama 4],Watsomanat Wihan stands in all its ar architectural splendor on Krungkasem Road. The construction of this temple shows the refined workmanship of skilled craftsmen from the Rattanakosin era. There are a number of uniquely beautiful mural paintings in its wihan or chapel. Lines and colors in thesa murals are painstakingly and attentively drawn and applied in a style similar to paintings at other temples. At Watsomanat Wihan, however , the artists depart from tradition by omitting the life story of the Buddha, the Ten Reincarnation Jataka. Instead, aliterary masterpiedce from the rieign of Rama 2, the story of Inao, has been depicted. Dhammaa riddles and moral proverbs are included in every bay. The daily life of townspeoole in that era is describeb. Western perspective devices are used to show distance, an innovation in the traditional art of the day. These paintings are treasures to be proud of and should be preserved. Murals on the lower part of the first wall are selected for demonstration here. They are selected for demonstration here. They are paintings of architedture. Typical of the reign of Phrabat Somdet Phra Chomklao Chao yoo Hua, King Rama 4, are depictions of palaces, temples and mansions built of the masonry and plaster work which was pooular in that period. Western influence was very intense. Encompassing a wide space, the picure depicts, in a general way, the sky with clouds and a landscape with tall trees in foreground, middle ground and background. The painting illustrates the skills of painters in the fourth reign. They mastered the new techniques becoming available in that era. Nothein looks awkward. Landscapes like this, adapted to current popular trends, dominated mural painting in the reign of King Rama 4. Other elements, however, are in traditional Thai style. WARNING : The temple is not associated with the "guides" roaming on its premises.